Just as delicious as traditional meringues made with egg whites. Meringue cookies are a light, airy and crispy cookie traditionally made with egg whites and sugar. It's a simple recipe to make them, however, a successful outcome depends on knowing exactly when to stop whipping the egg whites to form perfect peaks. With the main ingredient being eggs, I previously thought that a high quality, allergy-friendly meringue would be impossible to replicate. That is, until I stumbled upon a website about vegan meringues made with Aquafaba. Aquafaba literally means "bean water" — the water beans are soaked in and that most recipes instruct us to discard. It was only in late 2014 that Joel Roessel, a French blogger, experimented with foam made of liquid from chickpeas and hearts of palms as an egg substitute in meringue. This eventually led to vegan baker Goose Wohlt's discovery in February 2015 that chickpea liquid alone can be used as an egg substitute. He was able to make a vegan meringue identical in taste and texture to the traditional meringues made with egg whites. Since Goose's discovery, the egg-free community has exploded with aquafaba experimentation. I was skeptical at first, as it looked almost too easy, but I decided to give it a try and taste it myself. I was pleasantly surprised that the resulting meringue cookies were crispy, light and tasted just like a delicious "regular" meringue. 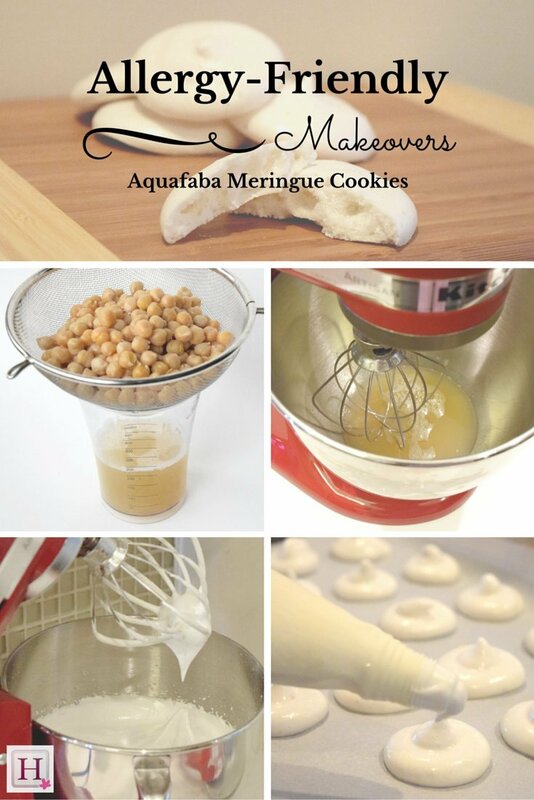 All you need is an electric mixer and three ingredients: aquafaba (chickpea water), sugar and pure vanilla extract. I was able to get one cup of aquafaba by draining a 19 fl oz can of unsalted chickpeas. One of the best parts about using aquafaba is that nothing needs to go to waste. Since this recipe only uses the chickpea water, I put the chickpeas aside for use in another dish. Pour the liquid from the can of chickpeas into a large bowl with the vanilla extract. I used the wire whip attachment on my mixer and whipped the aquafaba on high speed. I slowly added the sugar into the mixture while continuing to whip. The texture of the aquafaba starts to change after about three minutes of whipping, but it's important to continue whipping until the aquafaba is stiff and the peaks stand up on their own. Luckily, unlike eggs, there's actually no way to "overwhip" the aquafaba. It took about 10 minutes to achieve the right consistency, but I've read that it can sometimes take up to 15 minutes, depending on your mixer. Line a baking sheet with parchment paper and make round meringue cookies by using a piping bag or spooning drops of the mixture onto the baking sheet. Bake the cookies at 200F. I experimented with different sized cookies to test the ideal baking time. Small cookies using about one tablespoon of the mixture only needed about 1.5 hours of baking to yield perfectly crispy cookies. Larger cookies that used about two tablespoons of the mixture required about two hours and 15 minutes of baking. Allow the cookies to cool completely before attempting to move them off the baking sheet. The cookies harden while they cool. Enjoy these perfectly crispy and light allergy-friendly meringue cookies with a cup of coffee or tea. Preheat the oven to 200F (100C). Pour out the liquid from the can of chickpeas and add it to a large mixing bowl along with the vanilla extract. Line a baking sheet with parchment paper and use a piping bag, or a spoon to dollop on the meringue into even mounds. Bake for 1.5 hour to two hours and 30 minutes (depending on size of cookies), rotating the pans half way through. If the meringues are small or you want a chewy center, opt for less time. If they are large or you prefer a meringue that is crunchy all the way through, opt for more time. Pauline Osena is a food allergy advocate and founder of HypeFoodie.com, an online resource for allergy-friendly living. This former dairy junkie became an expert in allergy-friendly cuisine while figuring out how to feed her child with multiple food allergies. Pauline aims to inspire culinary adventures and experimentation with her series, "Allergy-Friendly Makeovers," and shares the valuable knowledge she has gained from her trials, errors and adventures in living with food allergies with "The Allergy-Friendly Top 10." Pauline's short-term goals include getting a full night's sleep and drinking her entire cup of coffee while hot.